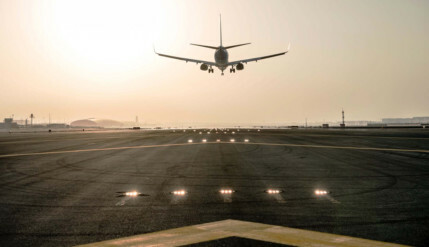 Beginning April 16, the southern runway at Dubai International Airport (DXB) will undergo a massive refurbishment, as a result of which some of its flights will either be reduced or diverted to Dubai World Central (DWC) or other airports for the next month and a half. ... the month of May is typically the quietest period in terms of traffic. This year, May also happens to coincide with Ramadan and is the best time to conduct the work. Lorne Riley, Director of Corporate Communications, at Dubai Airports told Gulf News: “Dubai International is one of the world’s busiest airports and there is never a perfect time to close one runway. However, the month of May is typically the quietest period in terms of traffic. This year, May also happens to coincide with Ramadan and is the best time to conduct the work. The northern runway was last refurbished in 2014. Asked what challenges DXB was expecting this time round, Riley said “Runway refurbishment is not new to DXB. As the site of numerous large-scale engineering programmes, including the upgrade of the northern runway in 2014, DXB’s operational, construction and engineering teams are well-versed in handling the challenges presented by massive, complex undertakings such as the upcoming refurbishment programme. "The northern runway reconstruction programme was a resounding success, completed on time and with minimal impact on customer convenience, so a similar approach is being used this time around. "As far as passengers are concerned, DXB’s one runway operation were said to have been optimised to a point where there will be only a 29 per cent reduction in the number of available seats. "Thanks to the additional capacity provided by DWC, the number of flights across the Dubai Airport system is expected to see a reduction of just 19 per cent. Emirates is expected to ground 48 aircraft during the runway repairs. 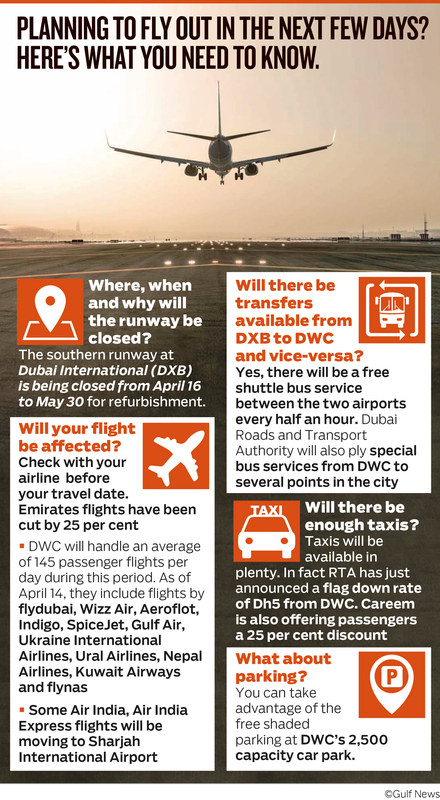 DWC, which is set to handle an average of 145 passenger flights per day, will cater to flydubai, Wizz Air, Aeroflot, Indigo, SpiceJet, Gulf Air, Ukraine International Airlines, Ural Airlines, Nepal Airlines, Kuwait Airways and flynas (as of April 14). Last week, flydubai announced that 42 of its flights, including those bound for India, Pakistan, Sudan, Egypt, Jordan, Kuwait, Saudi Arabia and Nepal, would move to DWC while Indian carriers Air India and Air India Express said they would operate some of their flights from Sharjah International Airport. These include the daily direct flights from Mumbai and Chennai to Dubai, daily flights on the Visakhapatnam-Hyderabad-Dubai route and the Bengaluru-Goa-Dubai flights. Among the Air India Express flights making the shift will be the daily flights from and to Mangalore, Delhi and Kochi. Dubai Airports officials said over 600 pieces of equipment have been moved to DWC in order to handle the additional traffic and ensure a seamless and smooth operation.